Duravit Architec wash basins, toilets, bidets and urinals impress with their modern form and functionality. The Duravit Architec bathroom ceramic series developed by Prof. Frank Huster is hygienic, comfortable and universally applicable thanks to its antibacterial WonderGliss coating. Thanks to a projection of 700 mm, the Duravit Architec Vital WC is barrier-free and ideally suited for semi-public and public areas. 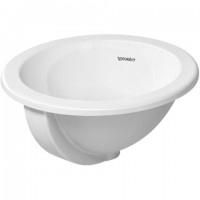 The corresponding Duravit Architec hand wash basin is available in numerous shapes and sizes, and of course as a wheelchair-accessible wash basin. The Duravit Architec urinal has been developed for the public sector and is particularly easy to clean. It is available as a classic urinal with water inlet from above, but also as a programmable electronic - Duravit electronic urinal.